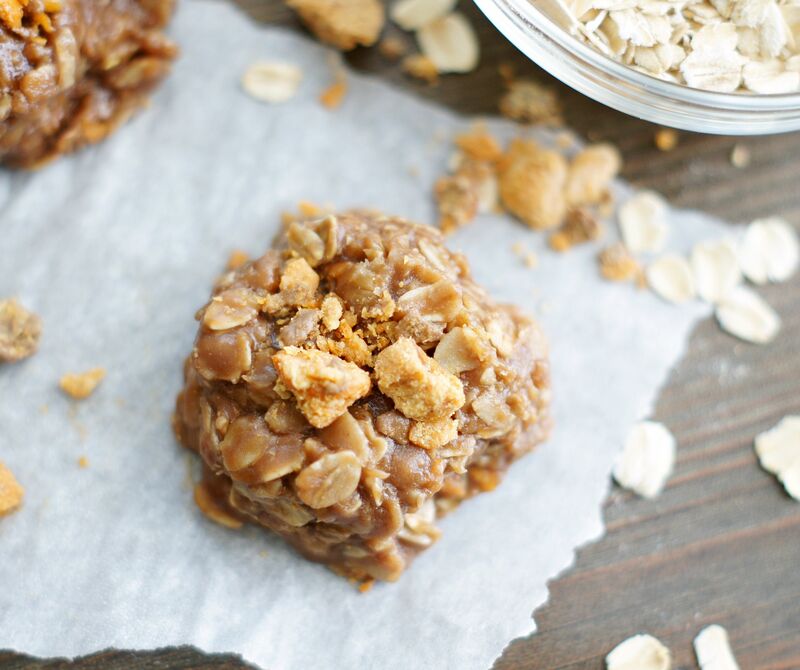 Raise your hand if you’re a fan of the classic no-bake cookie? I don’t know about you, but both my hands are raised. I love no-bake cookies. I’ve been making these since I was a kid. They’ve always been one of my favorites . . .I’m sure it has nothing to do with the fact that (1) it’s chocolate and peanut butter together, and (2) Duh, it’s a cookie. Well, they are completely fabulous as is, but I took them up a notch by adding some chopped up Butterfinger to them. Because there is no such thing as too much chocolate and peanut butter. I love the little bit of crunch the Butterfinger adds throughout some of the cookie, it’s perfect. 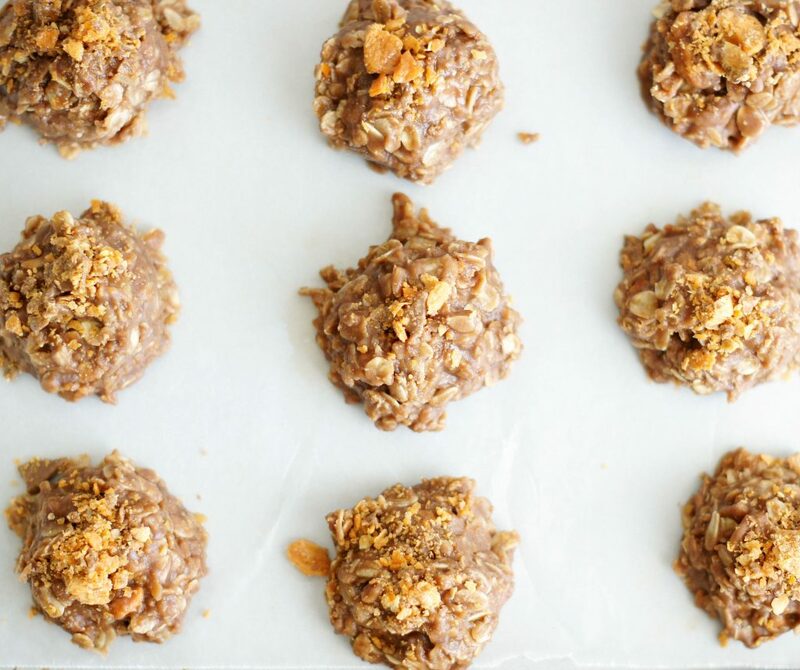 One of my favorite things about these cookies is the whole “no-bake” thing. . .no oven required is always a plus when those cookie cravings hit and it’s 97+ degrees outside (which it happened to be the day I made these). I also love how fast you can throw them together. The hardest part is waiting for them to set up, which I usually never do because I can’t wait that long, aaaaand I always seem to find myself licking the pan clean. If you’re craving something sweet, chocolaty & peanut buttery, then these cookies are for you. 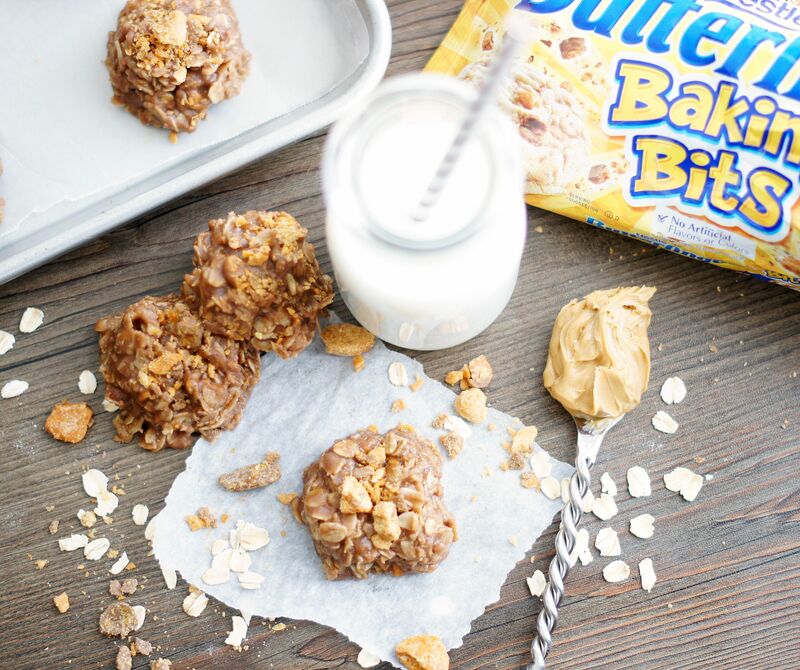 These No-Bake Chocolate Butterfinger Cookies are a fun twist on the traditional No-Bake Cookie. These are one of the easiest cookies you'll ever make. In a medium saucepan, melt butter. Add cocoa, sugar and milk and whisk together to combine. Bring to a boil and boil for one minute, stirring constantly. Remove from heat. Add peanut butter and vanilla stir until smooth. Add oatmeal and stir until well combined. Allow mixture to sit for 10 minutes to cool, stirring occasionally. 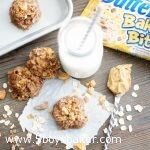 Gently stir in chopped Butterfinger and drop by spoonfuls onto waxed paper-lined cookie sheets. Garnish with more chopped Butterfinger. Let cool until set. Store in an airtight container. I found a bag of Butterfinger Baking Bits down the chocolate chip aisle at Walmart. They were so convenient because all the chopping was already done for me. If you can't find them, just go ahead and use whole Butterfingers and chop them up. These cookies were so excellent!!! I needed something quick for a party so I made these and they were just perfect!!! And super easy!!! Oh man, now I want to make these Shelly! I forgot how good they are. Happy to hear you loved them!